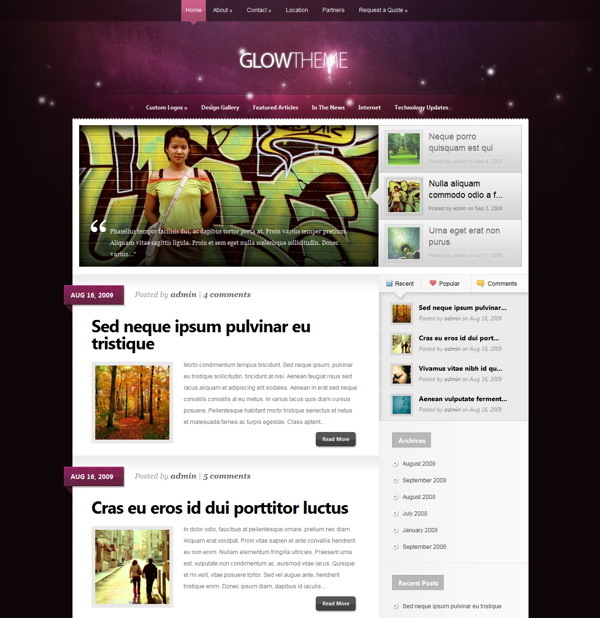 With its bright colors, bold text and flashy design, Glow is a great theme for anyone looking to make an impact. This theme comes with four color variations, and is equipped with the latest ePanel Theme Options page which gives you complete control over your blog. Glow comes with four different skins, and each skin with three different color schemes. For more info refer to the slider and preview links above. If you would rather not use the abbreviated post structure you can opt for the optional blog-style layout. When enabled, your posts will be displayed in full like a traditional blog. This theme utilizes timthumb to automatically resize your thumbnail images. Because of this, only one thumbnail images is required per post, despite the various thumbnail sizes used in the theme. With Glow you can place 125×125 banner images in your sidebar and 468×60 ads to your post pages with ease. Advertisements are handled from within wp-admin, and can be turned on and off at any time. eNews is an exercise in crispness and subtlety. 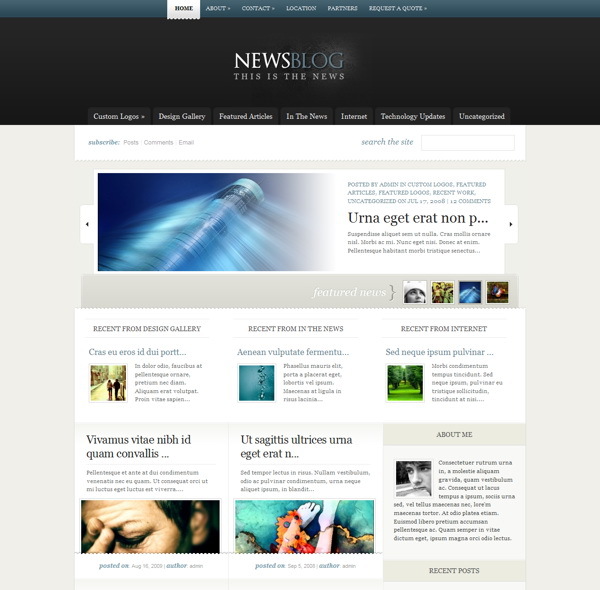 This elegant and professional news theme is great for anyone looking display a lot of content in a clean and userfriendly manner. It is perfect to start your own news-related blog or website, focusing on the content while presenting it with a clean and easy style… if content is king, then this theme makes the perfect companion for a good content. eNews comes with five different color schemes. If Blue isn’t your style, try out the Red, Green, Purple or Turquoise variations. If you would rather not use the abbreviated post structure you can opt for the optional blog-style layout. When enabled, your posts will be displayed in full like a traditional blog. This theme utilizes timthumb to automatically resize your thumbnail images. Because of this, only one thumbnail images is required per post, despite the various thumbnail sizes used in the theme. With eNews you can place 125×125 banner images in your sidebar and 468×60 ads to your post pages with ease. Advertisements are handled from within wp-admin, and can be turned on and off at any time. With the Bold theme the goal was to create something strong but also fun. This theme features a combination of bold typography, loose sketchy qualities and heavy textures. 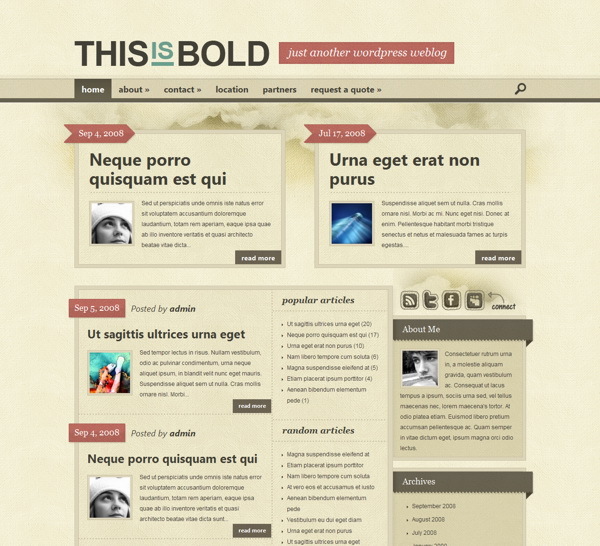 Bold features a robust set of theme options, as well as 5 unique color schemes. With its unique and playful style, Bold will surely help your blog stand out from the crowd. Bold comes with five different color schemes. If Red isn’t your style, try out the Blue, Green, Purple or Turquoise variations. If you would rather not use the abbreviated post structure you can opt for the optional blog-style layout. When enabled, your posts will be displayed in full like a traditional blog. This theme utilizes timthumb to automatically resize your thumbnail images. Because of this, only one thumbnail images is required per post, despite the various thumbnail sizes used in the theme. With Bold you can place 125×125 banner images in your sidebar and 468×60 ads to your post pages with ease. Advertisements are handled from within wp-admin, and can be turned on and off at any time.